My chicken strike might be over. I haven’t cooked chicken in months (as you may or may have not noticed). I like chicken but I’m really picky about the texture and taste. If I get a gristly bit (you know, a little cartilage or fat) or it tastes too chicken-y, then I’m done and won’t want to eat chicken for an extended period of time. Yes, I said “too chicken-y.” I blame my dad for getting that idea into my head. He used to say that all the time when I was a kid (and still does) and now as an adult I totally get it. No one else in my family gets it so don’t worry if you don’t get it either. Picture fish being too fishy, replace it with chicken, and that’s our issue with chicken. Since I’m so picky it’s usually easier to simply avoid making it. 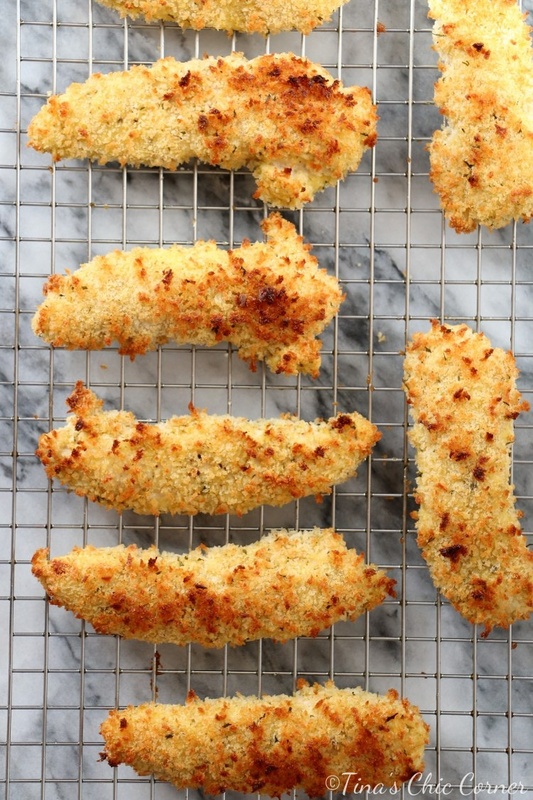 Of course, if you’re making these chicken fingers for kids then you can skip the salad and replace it with ketchup. (If your kids don’t like salad that is.) I’m doing the more adult thing and eating them with salad. My mom made a delicious chicken dish over the weekend and I really enjoyed it so maybe my strike is really over… for now. Line a baking sheet with tin foil and place a wire rack (i.e. metal cooling rack) on top. Spray the wire rack with cooking spray and set it aside. In bowl #2, whisk together the flour, garlic powder, and cayenne pepper. In bowl #3, whisk together the eggs, water, mustard, and thyme. In bowl #4, add the panko bread crumbs. Cover each seasoned piece of chicken (from bowl #1) in the flour mixture (in bowl #2). Then dip each piece of chicken in the egg mixture (in bowl #3). Finally coat each piece of chicken in the panko crumbs (in bowl #4). Transfer the chicken pieces to the prepared wire rack. Spray the chicken pieces with cooking spray and cook them for about 15 minutes or until the chicken is cooked. 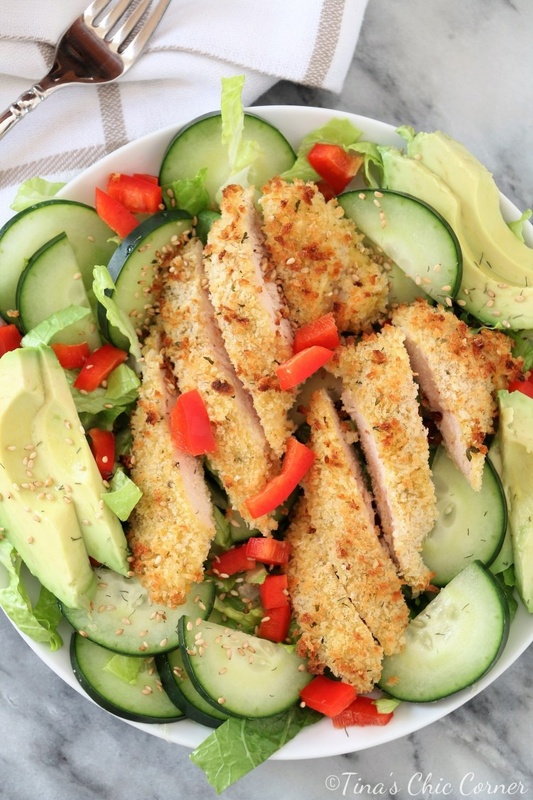 In a big bowl, combine the lettuce, avocado, red bell pepper, and cucumber. Pour in the dressing and gently mix everything together. 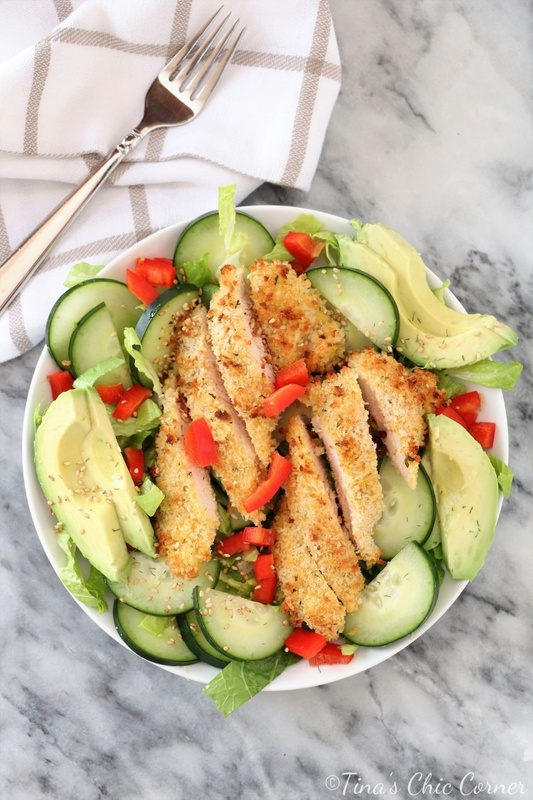 Add all of the crispy chicken fingers on top of the salad bowl, or portion out the salad onto plates and divide the pieces of crispy chicken evenly per serving. Sprinkle toasted sesame seeds on top.